The show is being broadcast on ZDF and can be seen everywhere in Europe through satellite, so always some million people watch it. I was chosen and casted as the best representative for "Queen" among many many other candidates. 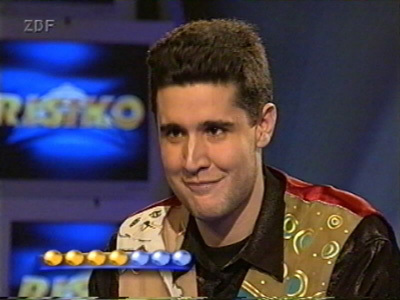 My shows were being broadcast on TV between April 24th-26th 2001. There are four candidates in every show. They compete against each other in the pre-round about general knowledge. or you´re out of the show, so it´s really kind of hard. Successful candidates can be in the show on up to four consecutive days (and every day the questions are getting more difficult). If the first three rounds have been successful I can choose either to leave after this show (with the money I have won until that moment) or to come back for a last time to the fourth show (and either win more money or with one wrong question lose everything I have won until that moment and get back home with nothing). you now have the possibility to see the three shows directly online through my site. After the successful third round I chose to go home with the money I had already won until that moment. I believe that you should leave the party at its best moment. 1.Queen were founded in 1970. Which band-member was the last one to complete the band in February 1971? 2.Freddie was born on an island close to Tansania. Which one? 3.Killer Queen was the first big hit of Queen. What´s the name of the LP, where it´s featured on? 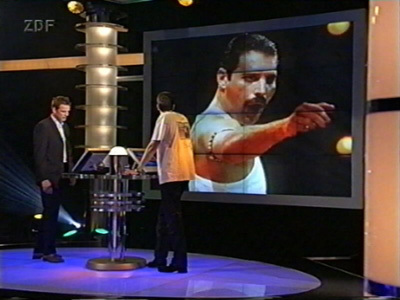 4.Bohemian Rhapsody was a single from “A night at the opera”. Queen were influenced to choose this LP title because of a famous US comedian team. Which one? 5.In 1972 Queen signed their first management deal. They were signed to a company, who were obliged to get Queen the best possible deal with recordings for a record company. What was the name of the management company? 6.In 1974 Queen II was released. The album contained a sleeve-note that a special instrument wasn´t used during the recording. Which one? 7.Freddie Mercury and Montserrat Caballe recorded a song together called “Barcelona”. It was chosen by the city of Barcelona to be the main theme for a sport event in 1992. Which one? 1.Queen singer Freddie Mercury wrote his first solo single “Love kills” with Giorgio Moroder for a film soundtrack. What is the name of the film? 2. In 1972 three members of Queen performed a cover-version of the Beach Boy song “I can hear music”. Which was the pseudonym it was released under? 3.Queen were in direct contact with the film producer of “Flash Gordon” with the result that they should write the main music to it. What was the name of the producer? 4 The producer of a BBC rock-show liked the song “Keep yourself alive”. He used the song for a film, which President Roosevelt used in an election campaign . What was the name of the show? 5. 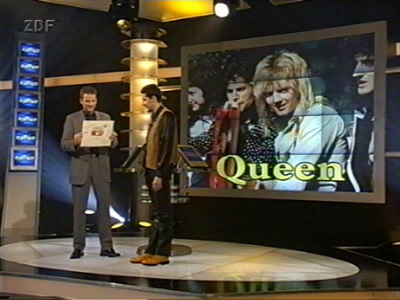 In February 1991 the last Queen album was released, while Freddie was still alive. What was the name of the last LP? 6. Queen perfomed their first live-shows in the USA in 1974. They were support band to an other English band. Which was the other band? 7.In October 1974 Queen went on tour in the UK. The shows ended with the song “Bring back that Leroy Brown”. Brian played a solo on a an exotic instrument during that song. What´s the name of the instrument? 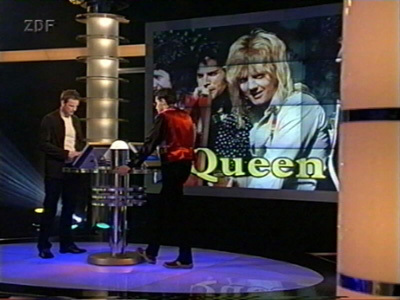 1.What was the working title for “Under pressure”, the song Queen perfomed together with David Bowie? 2.Norman Sheffield felt attacked on a song, which was featured on “A night at the opera”. What was the name of this song? 3. During the first show of the Japan tour in 1975 Sumo wrestlers were engaged as security. The concert took place on April 19th 1975 in Tokyo. What´s the name of the hall? 4.”Somebody to love” was featured on the album “A day at the races”. To promote the album Queen went to a horse racing. Which horse did they all bet on? 5. The Queen album “The works” contained ideas of the book “Hotel New Hampshire”. There was a song, which referred to a sentence of the book. What was the sentence of the book and the name of the song? 6. What was the name of the bicycle company, which provided the bicycles for the “Bicycle race” video-clip? 7. At the end of 1975 Queen changed their management. Until then they were signed to Trident. After they broke up with them, a famous face in the show-business became their new manager. What´s his name? Thanks a lot to Andreas Streng from the German Queen Fan Club for technical support! The real audio files have been provided in co-operation with the German Queen Fan Club. ...and thanks so much to Katrin, Markus, Norbert and my family for moral support concerning the preparations for the shows!